Réna Bradley is a designer and community advocate. Her experience working across the private, public and nonprofit sectors, has taught her that design is a tool to develop not only places, but a sense of well-being, unity, joy and agency in individuals and communities. In her current position as Bridge of Grace’s Community Development Director, she uses design as a tool to mobilize youth, residents, and volunteers who want to make a difference in their neighborhood. Her work in Fort Wayne has included 1) Launching Tired a Lot: a design camp where middle and high-school students design and build installations to activate vacant lots, 2) Leading Park to Park: an effort to engage University students and community members in the process of designing and building a neighborhood-playground using upcycled materials (including pallets), and 3) Creating and coordinating Wonderfully Made- an afterschool program that promotes faith, creativity, and career-exposure for young girls. 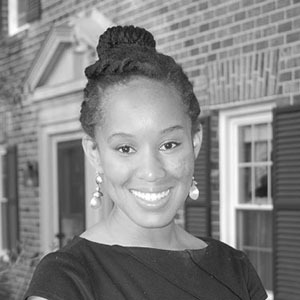 Réna earned her degree in architecture from Howard University and was formerly a Detroit Revitalization Fellow, VSAIA: Emerging Leader in Architecture, and co-chair of the AIA Detroit’s Urban Priorities Committee.